Yosemite Forum • View topic - Yosemite Miwok elder testimony in Deeper Than Gold, fiction? Yosemite Miwok elder testimony in Deeper Than Gold, fiction? Another example of the Yosemite Miwok fable. I enjoy reading my emails from the Frog and others. I like sharing them with people who are interested in the hisotory of the Yosemite Native people. Since I am one I also it is very interesting to me to see what will show up next. One blog was done by someone who read Brian Bibby's book Deeper Than Gold. They decided to review the part about the Southern Sierra Miwuks. They caught a big error in the testimony of Della Hern a PAIUTE elder now claiming to be Miwuk. She described an incident that could not have happened because of the age of persons and the weather. Link to original blog and the blog below that shows the error. I have seen the paperwork of the two women and what the blog writer wrobe about below is true. Louisa and Leanna Tom were born in 1863 and 1870. So the account in the book could not have happened. The problem we have noticed that even some Paiutes have been behind the ‘modifying’ of our Paiute Native American Indian history out of Yosemite. These Paiutes are now calling themselves “Yosemite Miwok/Mono Lake Paiutes” and even “Southern Sierra Miwuks”, yet many either have no Miwok blood or very little compared to their Mono Lake Paiute blood. If anything they should be called Yosemite-Mono Lake Paiutes, with some unknown western tribes’ blood. One of these “Southern Sierra Miwuk” elders did ‘personal testimony’ paid by the Yosemite Fund for Yosemite National Park Service. The personal testimony was conducted by Brian Bibby around 1995 and he added it in his book “Deeper Than Gold” and this is just my take or review of the “Southern Sierra Miwuk” elders’ personal testimony in the book. residents of Yosemite Valley were routed from their homes by the Mariposa Battalion in 1851. Della’s great-grandfather, known as Captain Sam, was forced to leave his two daughters behind as the able-bodied made a hasty retreat up the steep, treacherous trail leading out of the valley near Indian Creek. Now the problem with this testimony is that during this time Miwuks and Paiutes were enemies. She does admit that she ‘visited’ relatives in Yosemite during summer. She visited them from Mono Lake, where she lived and stayed as a child with her mother. The major part of her testimony in the book is when she recounts the tale of what she states her grandmother supposedly told her about her harrowing experience escaping the Mariposa Battalion in Yosemite Valley. The Mariposa Battalion entered Yosemite Valley in 1851 and in 1852. She stated that her grandmother and her sister were about 8 and 10 years of ago when their father, Captain Sam, hid them in a cave. The only problem with this is that Louisa and Leanna Sam-Tom were born from 1860 to 1870. 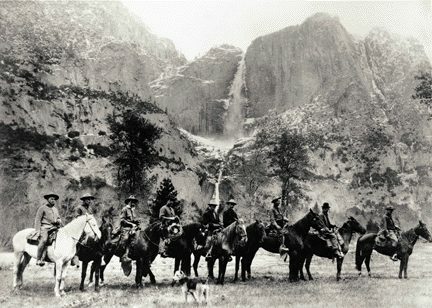 That is years after the Mariposa Battalion entered Yosemite Valley. Even their husband Bridgeport Tom was born around 1863. In other words they were not even born when the Mariposa Battalion entered Yosemite Valley. Also why is only Leanna and Louisa mentioned? What? No George and Mattie, Leanna and Louisa’s brother and sister? Captain Sam had other children. Oh, I forget their kids are in Paiute tribes, so they are not mentioned in the ‘story’. Leanna Sam-Tom, Yosemite - Mono Lake Paiute, 1924 Edward S. Curtis photo titled "A Lake Mono Basket Maker". Leanna Tom spent most of her life between Mono Lake and Yosemite. 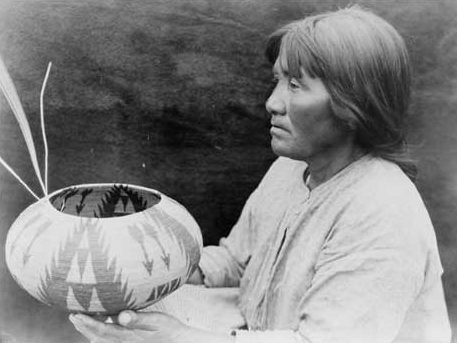 She was a well known California Indian basket maker. If she was 8 or 10 in 1851 Leanna Tom would be around 85 years old in this photo. Also the elder stated that the Mariposa Battalion horses were kicking up dust. If anyone were to read several early accounts of the Discovery of Yosemite, Yosemite Valley floor was covered with a blanket of snow. Meaning no clouds of dust could have been produced. They would have had to been so close that any dust in the wet snow would’ve effected them. If they were that close they would’ve been certainly discovered hiding in a cave. In his book “Deeper Than Gold” Bibby mentions Chief Bautista, who was not the chief of any of the Paiutes or Casson/Chuchansis who lived in and around Yosemite. In the book Chief Bautista is written as a great leader of the Yosemite Valley Indians, but in fact he was a great friend of James Savage of the Mariposa Battalion fame and not a friend of the original Ahwahnees. It would appear the testimony is historical inaccurate and impossible, but it does makes a great dramatic ‘story’.